This REIT has delivered amazing returns throughout its history. Are new investors too late? 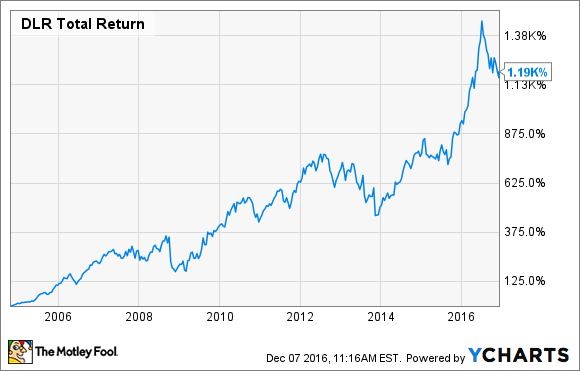 Data center REIT Digital Realty Trust (NYSE:DLR) has grown tremendously over the past decade or so. In fact, a $10,000 investment in the company's 2004 IPO would be worth more than $129,000 today -- a 22.9% annualized rate of return. Despite this incredible history of performance, there's reason to believe Digital Realty's best days are still ahead. Digital Realty owns, acquires, and operates data center properties, located all over the world. While most of the company's properties are in the U.S., the company has been actively diversifying its portfolio geographically, specifically in Europe with the recent acquisition of an eight-property portfolio on the continent. As of the end of 2016's third quarter, Digital Realty had 144 properties consisting of 25 million rentable square feet, and is the 12th-largest publicly traded REIT in the U.S. It leases its data center space to more than 2,000 customers, including major tenants like Facebook, IBM, LinkedIn, AT&T, and JPMorgan Chase, just to name a few. Digital Realty's top 20 customers account for 42.7% of its rental income, with no single tenant generating more than 7.5%. Source: Digital Realty investor presentation. With the rapidly growing need for data storage over the past decade or so, the need for data centers has increased tremendously, and isn't slowing down just yet. In fact, data center IP traffic and cloud IP traffic are projected to grow at annualized rates of 31% and 33%, respectively, through 2019. In fact, the market for data centers is growing so well that demand is outpacing supply growth in several key markets. For example, even though data center inventory has grown by about 17% in the Northern Virginia market in 2016 alone, the market has maintained an impressive 96% occupancy rate. In the Dallas and Chicago markets, all of Digital Realty's new-to-market inventory of the last 12 months is already 100% leased. Additionally, the company has allowed for expansion, as many of the company's properties have additional developable land, which can be used to meet customers' future needs. I already mentioned that Digital Realty has produced annualized total returns of nearly 23% since 2004, which is an extremely impressive performance figure considering that this is a period that included one of the worst recessions and real estate crashes of all time. Thanks to the industry trends I discussed earlier, Digital Realty has grown its core FFO at a 14% annualized rate over the past decade, and has increased its dividend at a 12% annualized rate. Because of this, the stock has done incredibly well -- an investment of $77,500 in 2004 with all dividends reinvested would have made you a millionaire today. Are the best days ahead? In addition to the continuously growing market, Digital Realty plans to achieve superior returns over the next several years by focusing on diversifying its product offerings and improving its operating efficiency. There is some room to lease up the current portfolio, especially in the wake of the recent Telx acquisition, which added several under-utilized properties to Digital Realty's portfolio. Further, as of this writing, Digital Realty's same-store occupancy (properties it already owned) is at 92.6%, which is significantly below previous levels. From a valuation perspective, Digital Realty trades for less than 15 times its projected 2017 FFO, far below many of its REIT peers. Since the current $3.52 annual dividend payout (yield of 3.9%) represents just over 60% of the company's expected FFO for 2016, there's no reason to believe that the streak of dividend increases will be in jeopardy anytime soon. In a nutshell, Digital Realty has delivered phenomenal performance for its investors, but there's no reason to believe that the company's best days are behind it. The need for data center properties continues to grow, and Digital Realty's scale should allow it to meet the market's needs more efficiently than its peers. The company still trades for an attractive valuation despite its excellent track record, so I believe Digital Realty will still be an excellent investment for the long term.